Stoneham Theatre will present "Sister’s Christmas Catechism," starring “Sister” Denise Fennell, from November 26 - December 23. "Sister’s Christmas Catechism," conceived by Maripat Donovan with Jane Morris and Marc Silvia, is the latest installment in the "Late Nite Catechism" series, a comically unconventional tutorial in Catholic holiday traditions. "Sister’s Christmas Catechism" is an opportunity to dive in and solve the real mysteries of the season -- perfect for those who need to know where the Magi’s gold is actually hidden. 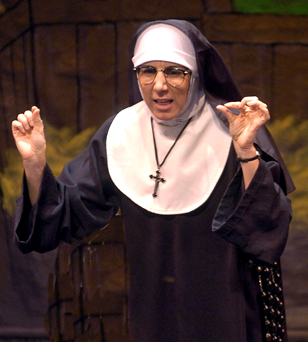 “Sister” Denise Fennell, Boston native now residing in Los Angeles, will conduct the proceedings while a local choir will not only be featured before the performance, but will also be lured into her classroom for the nail biting start of the show. The 1 p.m. performance on November 26 has been designated as Pay-What-You-Can. Patrons have the option of “buying” tickets one hour before the performance with a new unwrapped toy. All toys will benefit the U.S. Marine Corps Reserve Toys for Tots Program and will be distributed as Christmas gifts to the less fortunate children in the area. Toys will be accepted as for the 1:00 p.m. performance only. Stoneham Theatre is an official drop-off location for Toys for Tots; for more information about the program, visit www.toysfortots.org. Toy donations for Toys for Tots will be accepted through December 23. For information and tickets, stop by the box office at 395 Main Street in Stoneham, call 781-279-2200 or visit www.stonehamtheatre.org.